Wildwood’s camp staff love working with kids. They are hired for their maturity, outdoor skills, experience with children, and desire to change kids’ lives. All camp staff are background checked and attend a week long training. 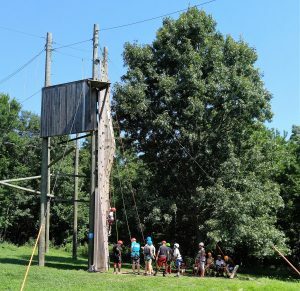 They are highly qualified and committed to provide each camper with a safe and rewarding experience. The staff-to-camper ratio is 1:8 or better to ensure maximum supervision. Camper health and safety is our primary concern. One of the ways we ensure we meet the camping industry standards in safety is by being accredited by the American Camp Association. The accreditation process involves a thorough review of our camp’s processes against more than 300 American Camp Association standards. All staff members are trained in basic first aid, and a number of staff positions require first aid certification and CPR. Certifications are also required for staff positions in aquatics. Program specialist positions in areas such as archery and challenge activities also require specialized training. Finally, Wildwood hires a Health Supervisor to oversee the health of the campers and staff in the summer. The Health Supervisor is responsible for administering medications and managing any first aid that is given. If your camper needs to see a doctor while at camp for a non-emergency, staff will notify you before they see the doctor. In the event of a medical emergency, your camper will be given first aid and taken to the closest medical facility for treatment. You will be contacted immediately if your camper is involved in a medical emergency. The camp director’s and the ranger’s homes are located near the entrance of camp. Staff training is conducted on emergency procedures. In addition, we contact area law enforcement officials each summer to let them know of our opening and closing camp dates.